Location: In the northern part of Guangzhou city, around 43 kilometers (28 miles) from Canton Tower in central downtown. Serving more than 110 air routes from and to over 100 domestic and international cities. The domestic flights are from and to Beijing, Shanghai, Xi'an, Kunming, Chongqing, Haikou, Chengdu, Hangzhou, Guiyang, Ningbo and Lianyungang, etc. The direct international flights are from and to Singapore, Kuala Lumpur, Bangkok, Osaka, Seoul, Ho Chi Minh City, Hanoi, Tokyo, Jakarta, Taipei, Hong Kong, Sydney, Amsterdam, Frankfort, Paris and New York, etc. Passport holders of 53 countries and regions are granted a visa-free stay of up to 144 hours when taking an international transfer via Guangzhou Baiyun Airport. Read details about 144-Hour Visa-Free Transit. Citizens of other foreign countries need to obtain a valid visa in advance if they will spend over 24 hours at the airport. If the stay duration is less than 24 hours, they can apply for the 24-Hour Visa-Free transit. 23:00 - 06:00 the next day: every 15 minutes. Guangzhou metro line 3 extends to the north and reaches the Baiyun International Airport. Passengers can travel between Airport South Station at Terminal 1 and Airport North Station at Terminal 2. Commuting is also feasible. This metro line is regularly operated from 6:00 to 23:45 and departs every 5 minutes, taking around 2 minutes between the two terminals. International Airlines: Korean Air, Air France, Aeroflot, Vietnam Airlines, Garuda Indonesia, Kenya Airways, and Saudia, etc. The airport has opened wireless Internet access. Select "airport-free-wifi" to open any web page in your browser. 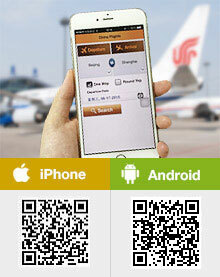 Terminal passenger service system supports scanning passport, boarding pass to obtain WIFI login verification code. Note: The charge depends on the size of the luggage. If storage time is over 24 hours, price will be accumulated according to the above price list. Note: The hourly charged room is expected to rent at least 3 hours. Note: The hourly charged room is expected to rent at least 2 hours. The foreign currencies include dollars, euros, yens, Hong Kong dollars and so on. Service hours: 08:00 – 21:00. Can I book a sleeping lounge at Guangzhou? I have a 7 hour layover at Baiyun International Airport. It says above that there are sleeping lounges / rooms, does anyone know if we can book these, and if so - how? I'd prefer to book online. CZ302 from SYDNEY to GZ on 2019-05-02, the departure time is 21:45 and the arrival time is 05:25. CZ360 from GZ to SanYa on 2019-05-04, the departure time is 09:35 and the arrival time is 11:05. CZ651 from SanYa to LONDON on 2019-05-05, the departure time is 12:05 and the arrival time is 18:45. Well, Claus, according to this situation, you cannot enjoy the 72 hours visa because you have two stops in mainland China. Thus you need to apply for the China visa in advance in your country. Hello, I am thinking about visiting Guangzhou Canton Fair and I have already an invitation. Is a Visa in this case an absolute must? I plan to fly from Germany. Would the combination -> Germany -> Hongkong -> ship to Guangdong -> not later than 3 days later back via Hongkong -> Germany possible? Or would Germany -> Guangdong -> Germany work? No, according to your travel route, you are not eligible for the 72 hours visa free policy. Thanks would directly Germany Guangdong Germany also not work? Yes, the departure and destination won't be the same. Thus it is also not eligible the 144 hours visa free policy. How difficult is it to leave Guangzhou airport to stay in a local hotel? Don't worry. There are detailed English signs at the airport. And you can communicate with the airport staff in English. In addition, it will be ok for you to find a hotel to stay. Just need to apply for a Stay Permit when you arriving at the airport.